College basketball fans under 40 probably don't know the name, but for a single season Michael Graham was the fiercest college basketball player around, ripping down rebounds in traffic as well as regularly getting into tussles with opponents. 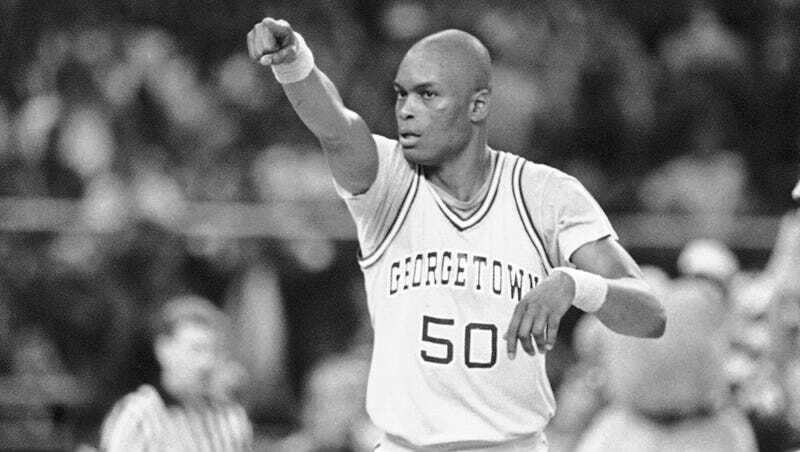 The season was 1983-84, and Graham was the most hated man in college basketball, but at the end of it the freshman helped lead Georgetown to the NCAA Final, where he dropped 14 points and five rebounds in the win over Houston. He even made the cover of Sports Illustrated. If Graham had made it to the NBA he would've fit perfectly on the the late 1980s Detroit Pistons, or perhaps with Charles Oakley and former college teammate Patrick Ewing on the 1990s Knicks. But Graham never made it that far. As Alan Siegel expertly recounts in Washingtonian, after the NCAA Final victory, Graham would never play for the Hoyas again, and his life followed a similar path to what you've read in other stories of athletes who failed to live up to their potential. Missed opportunities. Poor decisions. Second chances followed by screw-ups followed by third chances. A decade spent bouncing around basketball backwaters like Tulsa and Portugal. That day, his shift began miserably. After hearing that the Georgia Avenue location was missing some laptops, he drove over to see what he could find out. After his questions turned up little, he headed back to his usual posting in Capitol Heights. On the way, he stopped to use the bathroom at a gas station. As a courtesy, he wanted to buy something first. But nothing in the snack-food aisle looked very appetizing. So instead of candy or a bag of chips, he bought a lottery ticket. "By the way," he remembers asking the clerk, "you got a bathroom in here?" "No," the man replied from behind a glass partition. "No public bathroom." Graham was so angry he almost tore up the ticket. A few nights later, Graham was nodding off in front of the nighttime newscast when he heard an anchor mention that DC Lottery officials were looking for someone who'd purchased a winning ticket at a gas station on South Dakota Avenue. Instead of checking his ticket right away, he went back to sleep. The next morning, he finally looked at it after getting out of the shower. "I couldn't believe it," he says. Excluding the Powerball, Graham had hit five numbers: 3, 7, 21, 44, and 53. The prize was $1 million. After sprucing up the gravestones of his mother, grandmother, and aunt, and buying a house, Graham is pouring his lottery winnings into opening Michael G's BBQ Backyard Grill. He seems fully aware of the low rate of success in the restaurant business—and despite planning to open in January Michael G's BBQ Backyard Grill has yet to serve a single customer—yet he plowed ahead anyways. It may well fail—most small businesses do—but it would be quite the story if the man who inspired the hottest takes of 1984 ended up running a successful restaurant he funded with lottery winnings. Siegel's is a good tale, and well worth the read.